Continuing their coveted collaboration, the adidas Originals YEEZY 500 ‘Salt’ is the latest model from the creative minds of adidas Originals and Kanye West to hit the shelves. Stepping away from Boost technology, the Yeezy 500 instead opts for a high-performance ADIPRENE+ midsole instead. 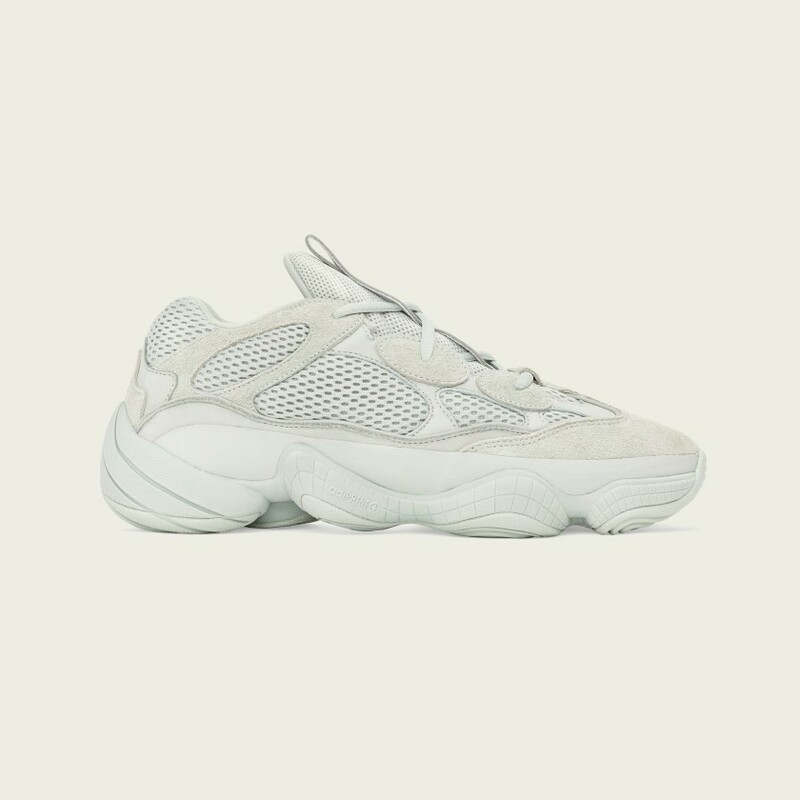 Using a similar sole unit to the one used on the 1999 adidas EQT Responsive, it seems Kanye West has turned over a new creative leaf with the adidas Originals YEEZY 500. Although the technology may have changed, the buzz surrounding the model and appeal amongst YEEZY fans have remained the same. Their bulky and retro-yet-futuristic aesthetic is a clear and distinctive addition to the YEEZY brand. Following from the success of the dark and moody ‘Utility Black’ colourway earlier this year, the YEEZY 500 returns in a lighter, ‘Salt’ colourway, sitting somewhere in between grey and white on the colour spectrum. Be it the premium leather, suede and breathable mesh panelled upper, or the exaggerated ADIPRENE+ cushioned sole unit; from top to bottom the latest YEEZY release is adorned in the minimal tonal palette. Reflective piping around the eyelets is the only vibrant addition, ensuring your monotone trainers won’t fade into the darkness and the sought-after sneakers are finished with a rubber outsole, providing ultimate grip on a range of surfaces. With the previous three colourways selling out worldwide within minutes, this ‘Salt’ release is expected to follow suit and their release is not to be slept on. The adidas Originals YEEZY BOOST 500 ‘Salt’ will be available on the size?previews app and in selected size? stores on Friday 30th November, priced at £170.